Billy Joel sings a medley of songs by Elton John at the Kennedy Center Honors concert in 2004. Billy himself received the Kennedy Center Honor in 2013 (see video). For videos of Billy and other musicians from 1981-2000, click photo below. For videos of Billy and other musicians from 2001-2015, click photo below. While Billy's music reflects a wide variety of diverse interests, there is no question that The Beatles were Billy's biggest influence as he has repeatedly stated. After seeing The Beatles' iconic appearance on the Ed Sullivan Show in 1964, Billy decided he would follow in their footsteps. Here was a group that wrote, sang, and played their own songs. They weren't Fabian, Frankie & Annette, or even Elvis in Clambake, they were authentic, talented, and wise-asses, all at the same time, just like Billy. Billy has recorded several Beatles songs ("Back In The USSR"), several Beatle-like songs ("She's Right On Time'), and appeared onstage with Paul McCartney several times. When you play with your musical idol, you know you have arrived. Watch Billy discuss The Beatles' "A Day In The Life" from his 2001 Master Class broadcast on A&E. Billy recorded Paul McCartney's "Live and Let Die" (iTunes) and "Maybe I'm Amazed" (iTu) for the 2015 tribute album to McCartney, The Art of McCartney. He talks about these recording on this video. Billy discusses his musical influences in these snippets from SiriusXM in 2016. 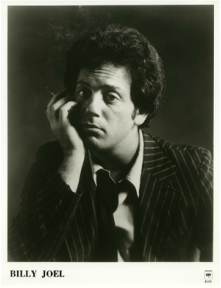 Billy Joel has been compared to many of his contemporaries like Bruce Springsteen, John Mellencamp and Harry Chapin, but the artist he is most often compared to is Elton John of course. In the early 1970s, there was no recording artist bigger than Elton. His albums dominated the charts and his live performance of "Bennie & The Jets" at the Hollywood Bowl (?) and on Soul Train are quintessential Seventies musical moments. Elton's star descended in the late 70s while Billy's rose, but they both had long-standing careers. And years later they made beautiful music together on their Face to Face tours which have been going strong since 19. Personally, I always thought that Rickie Lee Jones' songs, especially from her first two albums, Rickie Lee Jones and Pirates, were more like Billy Joel' s songs than were Elton John's. Her "Saturday Afternoons in 1963" reminds me of "Souvenir" meets "Through The Long Night." Sara Bareilles, Little Voice album cover. Billy stopped recording pop songs after 1993's River of Dreams, and then grunge and hip-hop dominated the music scene. By the mid-2000s, however, the singer-songwriter genre returned as a new wave of singer-songwriters, mostly female, appeared including Sheryl Crow, Sara McLachlan, Vanessa Carlton, Jewel, Alicia Keys, Anna Nalick, and several others. But the best is Sara Bareilles. Like Billy Joel, Bareilles' songs feature beautiful melodies and hooks, amazing piano-playing, strong vocals, and clever lyrics. While "Love Song" was her big hit, her debut album, Little Voice, had several standouts: "Gravity," "One Sweet Love," and "Between the Lines." The latter is one of the best break-up songs ever. And of course, another talented musician is Billy's daughter, Alexa Ray Joel. I like Alexa Ray's "Invisible" and "The Revolution Song." She does a cover version of "Just The Way You Are" as well which first appeared in a Gap television ad. Maroon 5's Adam Levine is also a fan and follower, and Billy is the only one who knows where the name Maroon 5 came from as Levine explained to David Letterman. Billy talks about his love for The Beatles and its individual members, from the SiriusXM radio channel. Billy talks about his admiration for Led Zeppelin, from the SiriusXM radio channel. Billy talks about his influences, including Bob Dylan, Cream, Don Henley, and Ray Charles, from the SiriusXM radio channel. Billy discusses several musical influence including Dave Brubeck, Gordon Lightfoot, and Procul Harum from the SiriusXM radio channel.